The International MXT Pickup - MXT stood for Military Extreme Truck - was a version of the International CXT pickup designed for both military and civilian use. A military-only version, the MXT-MV was also produced. 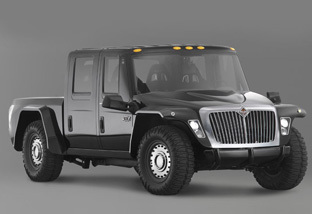 The International MXT Pickup featured an extensivley modified chassis and the cab was positioned closer to the ground. In addtion the International MXT Pickup featured a redesigned cargo bed and a different grille and headlight units from the CXT on which it was based. Powering the International MXT pickup was a V8 diesel engine producing 300 horsepower and mated to a 5-speed automatic Allison 2000 transmission.